I have been contemplating writing a blog for 5 years – I lacked the confidence and to be honest now only 3 weeks in I am kicking myself that I did not do it sooner. I LOVE it! The thing I love most is that I am documenting those days, the emotions, the details that may otherwise be forgotten. The ordinary every day that I know have been lost, some of my 5 year old’s early years I can’t recall and I wish I did. At the time I felt like this was amazing and I wanted to remember it forever, the feeling lingers but the details drift. Especially as having your first is such a different experience to adding to the family. Anyway I digress, so I am going to write some posts retrospectively, recorded for me, for my little ladies and forever. I will start with Little Lady E’s birth since that is indeed where it all began. Life transformed in that very moment. Everyone has their own story to tell, each different, each wonderful, I love reading birth stories and this is mine. My pregnancy was not exactly straightforward as I had a severe form of pregnancy sickness, Hyperemesis. Only I didn’t realise. It was not until at 9 weeks pregnant I ended up severely dehydrated, 7 stone and admitted to hospital for a week on a drip having to abruptly announce my pregnancy earlier than I would have liked or was really ready for. Unfortunately for me it lasted in varying degrees for the entire time, and I spent most of my pregnancy confined to the upstairs of my house as the smell of the wooden floors downstairs made me sick, and don’t even get me started on the smell of the fridge or the oven – thank you pregnancy super smell. At 17 weeks I had some blood tests and a few days later I vividly remember the moment my phone rang at work and I was told that I had a high hormone level which meant there might be something wrong with the baby and they would like to schedule my anomaly scan for the very next day. As you can imagine I was terrified, I had starved this poor baby, lived on not much more than popcorn and dry toast, not stomached a single vitamin tablet and was certain that I had not done the one and only thing that as a mother to be I needed to do for my baby at this point and helping it to thrive. This was all my fault, I felt sure it would be life changing news and the next 24 hours were spent in tears of guilt and fear. It was the longest day ever. All was clear with the scan and I cried buckets more tears. Joy, relief, i am not even sure but the anticipation had built up so much I think I would have cried regardless. But to see my baby again, heartbeat and all was magical. It was explained to me that this high hormone level afp was a marker for increased rates of stillbirth and failure to thrive in the later part of pregnancy so I was booked in to be monitored when I got in my 30 weeks. This wasn’t yet over. I spent the rest of my pregnancy battling hyperemesis, work and the worry that I would not in fact come home with my baby. I was due on 20th January 2011, and on Christmas eve I went for an appointment and a scan. They decided to induce me at the next available time. Now everyone knows that those days between Christmas and new year become a blur of celebrating, overindulging and wondering what day it is! Well this was just about to change forever for us. I was booked in for induction on 29th December at 37 weeks. We didn’t tell anyone as we still wanted that surprise element for everyone when we announced the babies birth, and to be honest just wanted to be in our own little bubble without thinking about anyone else especially as we had some unknowns there and until we were happy safe and settled with our baby in our arms, it was just us. We turned up at 7.30am sharp to be told at 37 weeks with my first baby this could be a long process. I had a pessary and that day was spent pacing the hospital corridors seeing the same people over and over trying to do everything I could to speed the process along and help my baby and my body out a little bit. Things progressed a little and I was left to see how I got on myself for the day. By the evening they said they could break my waters however there was not space on delivery so Mr S was told he could go home. They would probably have to wait until morning and I was advised to have as much rest as I could between contractions. No sooner had Mr S got home and had something to eat than I called him to tell him someone had delivered and I was going down to delivery at 1 am – this was it. I had my waters broken and spent two hours walking, on the birthing ball, again trying everything to get started before they had to start me on a drip. Unfortunately this didn’t happen and they did in fact start the drip 2 hours later. Oh my did this make a difference, the contractions came thick and fast and as they turned up the dose and a few hours passed they were too painful and too close together to manage by myself. Although I had gone into the whole process thinking I would have liked to have had a drug free labour, that wasn’t my story and you have to be open-minded in this baby business! By 9 am I was begging for an epidural. 3 hours and alot of playing trivial pursuit later and I was almost 10 cm, Mr S was told to go and get some food as we would soon be pushing. How exciting. I started to push at 1 pm and pushed for 2 long hours. This is where it got a little manic and things are blurry. The baby’s heart rate was dipping so there was suddenly lots and lots of people around me. There were forms to sign and they were taking me into theatre to try forceps and deliver by C-section if this did not work. All I could think is that I had not gone through all of this for 2 days to now have a C-section and remember being terrified for the baby at this point and just wanted it to be ok. Mr S was taken to a side room to get his scrubs on as he could be with me, the time he was gone felt so long. I stared at that theatre ceiling and cried. I just felt overwhelmed, I was frightened, on my own and also knew this was the moment no matter how, our baby would be born and I most certainly did not want to do that by myself. A kind midwife was there, she wiped my tears and held my hand. Husband on my arm again and I asked the obstetrician how many times she would try with the forceps before a c section and she said three times. I thought lets do this, one contraction, an almighty effort of a push and I was totally determined to get this baby out. Just like that on 30th December 2010 at 3.46 pm she was here. It was a girl. 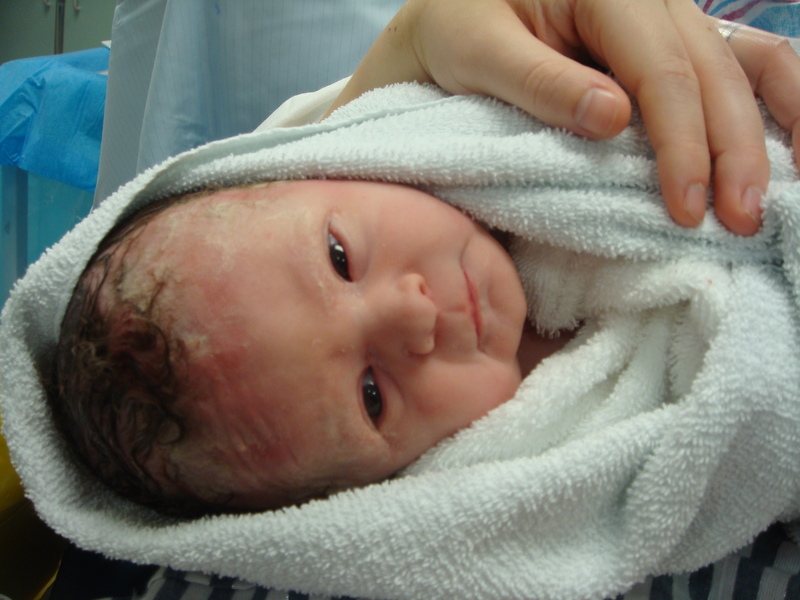 She was mine, all 6lb 10oz and full head of dark hair. All fingers, toes, a beautiful, breathing perfect human being. And in that moment the hyperemesis fog lifted and there, in front of my eyes, in my arms was the reason, all that, the story, the 37 weeks. Is a love story. From beginning to end. As I write and go through every detail with tears in my eyes to try and record that moment, that day, it almost feels like yesterday. 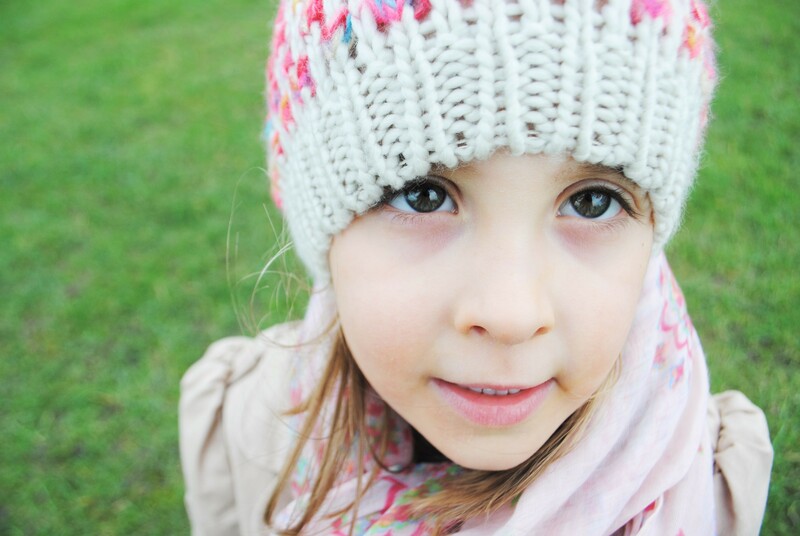 But then 5 years has flown by in a flash and suddenly she looks like this. I could still get lost in those eyes every moment of every day. Linking with the lovely Jenny over at LetsTalkMommy for Share with me for the first time. Thank you. Yes I am loving documenting these things, I’m currently writing up my youngest Little Lady’s birth story too!